As we’re approaching the ISA allowance cut off date in the UK, we thought it would be a good idea to share a little more information about the various ISA options available. In this post we’re going to talk about how much money you can put into a Junior ISA each year free from tax, or the Junior ISA allowance as it’s otherwise known. How Much Can You Invest in a Junior ISA? The Junior ISA allowance is the amount of money you can invest in a Junior ISA each year tax-free. In the UK, the Junior ISA allowance is currently set to £4,128 but this amount will likely change in future tax years. This is the maximum amount you can invest each tax year and your allowance will not roll over into future years if you don’t use it, so if you want to make the most of your full annual Junior ISA allowance then you will need to subscribe your cash to an ISA by the ISA allowance cut off date, which is April 5th in 2018. 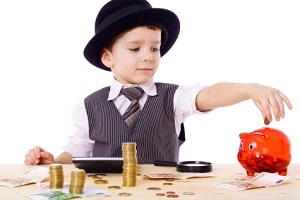 It’s important to remember however that you don’t have to use up ALL of your annual allowance if you simply don’t have the cash available, as many Junior ISA providers like will allow you to start investing in their Junior Stocks and Shares ISA from as little as just £10 per month if that is all that you can afford. They may also even offer you a one off gift or incentive when you sign up for a Junior ISA, so keep your eyes open for deals like that. What Kind of ISA Can You Invest In? The first thing to mention is that Junior ISAs are available to children who are under 18, are resident in the UK and who didn’t qualify for a Child Trust Fund. If your child did qualify for a Child Trust Fund then you can transfer this to a Junior ISA instead but you will have to fill in a transfer form. Once you’ve established that a Junior ISA is the right option for your child, you can then go about finding the best Junior ISA for you. You can invest in either a Junior Cash ISA, a Junior Stocks and Shares ISA, or a mix of the two. You can’t have more than one Junior Stocks and Shares ISA, but you can switch from one provider to another if you would like to. When Can Your Child Access the Money? Any money invested in a Junior Stocks and Shares ISA belongs to the child whom it was set up for. Their investment pot will grow over time and this should therefore be viewed as a long term investment. The money can then be accessed by your child when they turn 18 years old. To sum up then, the Junior ISA allowance is the amount of money you can put into a Junior ISA each tax year free from tax. If you don’t use up all of your allowance in the current tax year – which runs until April 5th – then your unused allowance will not roll over to the next year and will therefore be lost. The Junior ISA allowance for the current tax year 2017/18 is £4,128 but this may change in future years, in which case you can check out the latest allowance rates on the government’s own website.